Walnut farmers and processors face unique inspetion challenges when processing bulk nuts. Foreign contaminants such as metal, glass and stone can be picked up during harvesting or introduced throughout the production process. Metal detectors and visual examination are common industry inspection methods. However, these are not entirely accurate since glass and stones will not be identified by a metal detector and may have a similar shape and color as the walnuts. Visual methods are also limited to the top layer of the product, which means anything that can’t be seen will not be identified or removed. Most metal detectors remove contaminated product via a sweeper reject that clears product from the entire width of the belt. This ensures the contamination is eliminated, but also rejects much of the good product to be sent for rework. While these technologies provide adequate protection against metal contamination they cannot protect against non-metal foreign materials encountered during walnut processing. When bulk walnuts are inspected by an x-ray machine, this is generally in the raw just after the hulling process. Most x-ray systems employ single energy x-rays that have difficulty detecting common contaminants such as stones and glass that share similar physical characteristics and densities as the nuts. Not all x-ray systems have the same detection capabilities. Selecting a specialized system designed for the inspection of unpackaged or bulk walnuts is a key factor when implementing an effective inspection solution. 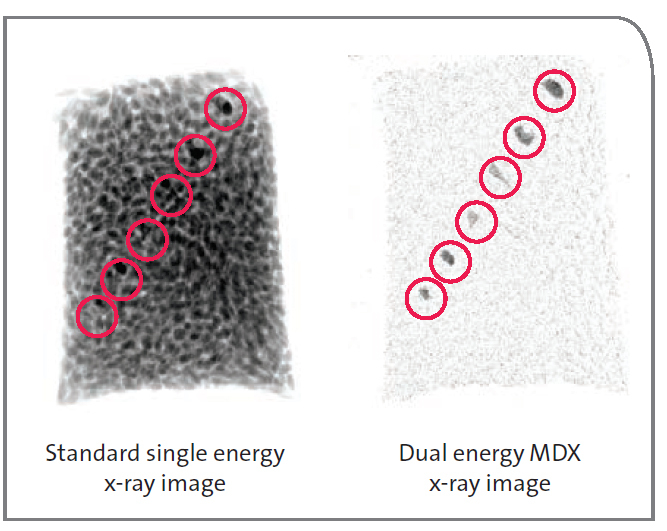 X-ray systems equipped with dual energy x-ray technology, such as Eagle’s MDX (Material Discrimination X-ray), provide advanced image processing delivering enhanced contaminant detection based on a material’s atomic number and not on density alone. Applying this technology to food inspection has provided nut processors with a valuable advantage: improved detection accuracy using two x-ray energies. MDX technology, paired with a robust system designed specifically for bulk applications has the capability to detect those hard to find contaminants like glass, stone and metal. and remove contaminants in bulk walnuts, thereby increasing yields and process efficiencies by reducing the amount of rejected products and rework to a fraction of the amount of conventional sweeper rejectors. Additionally, walnut processors can eliminate potential contaminant claims made against entire truckloads of product that traditionally impose sizeable fees. Eagle Product Inspection makes the safety of your products, your customers and your business a priority. 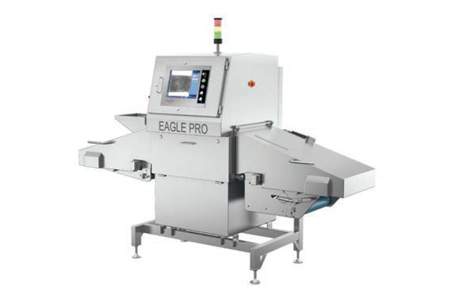 Understanding the unique challenges walnut processors face makes Eagle the optimal choice for quality product inspection solutions.